I have been using my facility's current electronic health record (EHR) for more than two years now, and for me the biggest challenge has been to learn to document a patient visit in an entirely different way. Like most of you, I grew up on the “SOAP” progress note (Subjective, Objective, Assessment, and Plan), and I worked my way through each visit in the order of these elements. During the first year using our EHR, I attempted to emulate that process, and it was a miserable experience. Even with fast Internet access, our system loads new windows slowly. As a consequence, “click minimization” has become a priority and jumping around in the record is to be avoided at all costs. I learned to customize my charts to make more windows open in the order I wanted, but that took me only so far. After that, I capitulated and worked the way the system wants me to. It just took too much time to persist in my paper chart order. This produces some oddities. For example, I now put all of the “S” and relevant “O” information in my EHR's problem list. Is it a big problem that I am entering elements of the interval history, physical findings and lab data under the “A” and “P”? I don't think so. Perhaps I am just justifying my capitulation, but the “classic” SOAP note, as described by Larry Weed in the Irish Journal of Medical Sciences, is only 50 years old. Continued evolution is to be expected and desirable. In fact, the EHR supports the intention of the problem-oriented medical record better than the paper record; the form itself is not really the point. Still, as a teacher, it makes me a bit crazy to enter data I have been telling generations of students belongs in the interval history or “Subjective” in the “A” and “P.” In addition, I can't bear the notes produced by the drop-down note function in my EHR. The text sounds as if it were written by Hal the computer from “2001: A Space Odyssey.” Although I am a painfully slow typist, I prefer to type my notes. Related concerns include “note bloat,” resulting from extensive use of prepopulated templates and from cutting, pasting and copying forward reams of text. For all of this, though, there are great things about the EHR. Here are my top 10. 10. Future appointments and test dates. It is a great convenience, especially with very complex patients, to be able to see what is on the docket. With one click, I can see when my patient with end-stage renal disease and impending dialysis is next scheduled to see her nephrologist or when the patient with the likely rotator cuff tear will be getting his MRI. 9. Three-click refills. Refilling patients' standing medications is easy, and with the exception of controlled medications, the prescription is instantly at the pharmacy. Given my travel schedule, the ability to take care of this kind of routine business no matter where I am is a boon for my patients and for colleagues who otherwise would need to cover for me. 8. Patient access to chart information. My patients appreciate the opportunity to see elements of their charts. I have had patients write me to correct their family histories, immunizations and allergies. No one has a greater interest in the accuracy of the chart than the person it is about. 7. Ability to see what subspecialists are doing. Back in paper chart days, our medical records department charged outpatient practices for providing charts. In response, many practices, including mine, developed a shadow chart system. Relentless effort was required to keep the shadow chart current with imaging results and the notes and reports of subspecialty members of the care team. Now we are all using the same chart, and I can see exactly what my colleagues are thinking and doing. 5. Enhanced role of nonphysician staff. The EHR has allowed our medical assistants and front desk staff to assume considerably expanded roles. The medical assistants can identify missing immunizations and health care maintenance interventions, discuss these with patients as they room them, and tee up orders. The front desk staff can manage much more complex interactions with patients, documenting detailed messages. 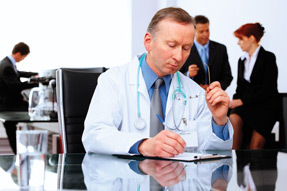 The physician can then provide a “script” for the front desk staff member's response or request that an on-site clinician call the patient or organize next diagnostic steps. Patients appreciate the faster responses to their messages and have been comfortable that their physician is overseeing their care even when they are speaking to others in the practice. 4. Registry function. Having done a quality improvement project involving 200 diabetic patients in our practice 10 years ago, I know the heroic effort required to develop a registry and to characterize the care of an enumerated panel of patients without an EHR. It is now a simple matter for me to identify all my HIV patients, for example, and find those who are overdue to have a viral load measured. 3. Medication history. Our EHR makes it easy to reconstruct the sequence of medications. Recently, a patient of mine with rate-controlled atrial fibrillation developed exertional dyspnea and an increased ventricular response. Because he has been on an intentional weight loss program, he was requiring fewer medications and several different clinicians had been adjusting his antihypertensive regimen. By looking at the EHR, it was relatively easy to ascertain that the problem had developed after a physician had stopped his metoprolol. 2. Faster return of lab results to patients. Returning lab results to patients who have signed up for the patient portal is a three-click operation, beginning to end, that can often be done on the same day as the clinical visit. Previously, because of the burden and expense, we often did not return normal results, so patients who did not receive a lab mailer were left to wonder whether their results had been overlooked or were simply normal. 1. Availability of the problem summary. The greatest strength of the system, in my opinion, is the ability to create a high-quality summary of every patient's important problems that is shared among the treating clinicians and is accessible 24/7. A bonus has been the written visit summary: Meaningful use requires that patients be provided a summary for each office visit. My EHR automatically generates a document that includes the med list, allergies, and any procedures done during the visit and lists each problem with which an order was associated or under which an “A” and “P” entry was made. The document also includes a field in which the clinician can personalize and humanize the summary, with comments such as “Congratulations on your weight loss. Keep up the good work.” These have been very well received in my practice. These are still early days for EHRs. Like many of you, I am frustrated by the clunkiness of our system and, two years into our implementation, am still not able to see as many patients as I could using my paper charts. Although I believe we will continue to see growing value with EHRs, fully realizing their promise will require an effective collaboration between vendors and the primary users, physicians. Recent surveys demonstrate declining physician satisfaction with EHRs as the market share of the large players increases. I hope that vendors take this as a wake-up call.